Gypsy Scholar: Milton's 'Awkward' Grecism: "know" with nominative participle? Milton's 'Awkward' Grecism: "know" with nominative participle? "Back to the thicket slunk . . ."
And knew not eating death . . .
Other scholars offer the same explanation about the Greek model. But knowing this fails to reduce the awkwardness, so why does Milton borrow Greek syntax? Partly, to achieve ambiguity -- Eve is eating death even as death is eating her. Maybe that's enough, though surely the same point could have been made without turning to such an awkward Grecism . . . so there might be more. Haynes, we should note, suggests that the strangeness of the syntax "emphasizes the momentous, mysterious nature of Eve's action: by eating the apple she is bringing death into the world" (page 79). I would take this one step further. English syntax is here broken to allow the entrance of something foreign, "eating death" as the all-devouring death that follows from sin in Milton's scripturally inspired thinking. This death enters now through the break. The colon in the line -- the very caesura that divides "And knew not eating Death" from "Satiate at length" -- punctuates this break. My colleagues at the Milton List, e.g., Michael Gillum, are generally agreed that the line holds more or less to iambic pentameter, but I would like to note that the awkward syntax and the use of caesura work against a smooth metrical reading. The line is awkward, and we are forced to pause, a hesitation reinforced by the single deviation from iambic in this line -- the stress on "Death," followed by stress on the initial syllable of "Satiate." 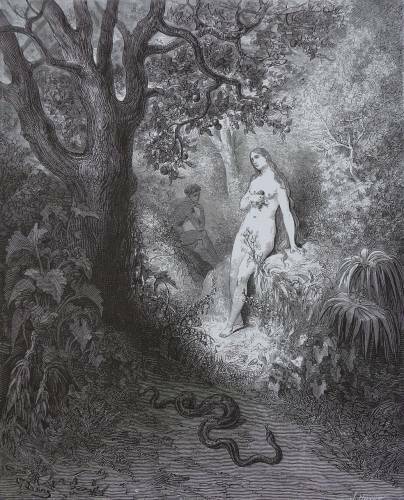 After that break, after that pause, Eve becomes evil, Satanic, "satiate at length," as though serpentine in sound and shape -- if one might draw out the length to which Milton goes to emphasize Eve's radical alteration. Think on the description of Satan "stretcht out huge in length" (PL 1.209), or even more clearly in Satan's own description of being "sated at length" (PL 9.598; emphasis again mine) in his deceptive claim to have himself eaten the forbidden fruit, an unmistakable verbal parallel that conforms Eve to Satan's image. More on this break at length . . . after a pause. "Greedily she ingorg'd without restraint,/ And knew not eating Death"
I think I may need a little grammar lesson, here. What rule in English bars the particular placement of the participle in this line? Grammar rule? Not sure on that. It just seems like awkward syntax. I'll need to reflect on this and also see what others say. I'm not sure why anyone has to resort to citing the non-authority of Greek grammar to defend the use of participles as used here. It is quite common in English to follow a verb with a participle and noun. It seems to me that the reason you think the line sounds awkward is because of the convergence of (1) the insertion of "not" between the verb and participle; (2) the fact that "eating" modifies "Death"; and (3) the fact that "Death" and "satiate" break the iambic pattern. The fact that a participle exists in this line has nothing to do with the perception of aural awkwardness. The use of "not" here is syntactically acceptable. But the infrequency of its use as seen here makes it seem exotic to the ear. >I ate not burnt toast. >I hung not dried fish. >I caught not flying bugs. >I saw not towering flames. >I knew not dying men. >I met not all-knowing God. >We are not eating machines. >She knew not eating Death. Even "I ate no burnt toast" sounds more informal or strange than "I did not eat burnt toast." Milton's line may have better suited you had it been written: "she...did not know eating Death." Ultimately, perhaps, it is neither syntax nor prosody, but the mere fact that "eating" modifies "Death," which rings false in your ear. If this is so, then I think you are just being ungenerous. The line here works in interesting ways. I even like your own reading of it. With semantics, syntax, and, possibly even, prosody working together in complex ways to drive meaning creation, I don't know what the fuss is about. It seems to me that this is what poetry is all about. And besides, I bet many of your favorite poems either have strange syntax or hide strange or nonsensical meanings because of syntax. This seems to be a characteristic of many great poetry. In fact, such strangeness may be what makes great poetry great and pleasurable in the first place. What do you suppose "dread feet" is doing here? You may be generous and take the line to mean that the speaker is marvelling at the appearance of Tiger's feet. But don't you think that the syntax compels a different meaning? Doesn't it sound as if "dread feet" is the subject of "twist the sinews of thy newly beating heart?" Or how about "Something there is that doesn’t love a wall" or "Whose woods these are I think I know." We accept the exercise of exotic syntax here because we like to pretend that this is how folksy people normally talk. This is similar to the way we accept the "not" in "she knew not eating Death." "Not," as used in the syntax here, imbues the line with a veneer of the epic. But we say the syntax of one line sounds folksy and the syntax of another, epic, only because we have been told to think so and not because there is anything inherently folksy or epic about them. Lollabrats, comprehensive as usual, I see. I'll have to consider your analysis. You make good points, but I continue to find something awkward in the line, as do many other readers. But am I wrong, and know not doubting stinginess? I think not. My point is that Milton has a reason for introducing awkwardness at this very point, for Sin and Death now enter the previously perfect world. But I'll need to reflect more on what makes the line feel awkward. "But am I wrong, and know not doubting stinginess?" It's the same thing here, Jeffery. The sound seems awkward to you because it is unfamiliar to you. It is the exotic quality that makes you pause. But I must disclose something. My ear is more accepting of this line because I actually write like this. ^I got into classical music via Scarlatti, Mozart, and Tchaikovsky. I found Shostakovich and Prokofiev odd when I first heard them. But today, I much prefer the latter composers to the former. What I am saying is that Aaron Copland sounds less "awkward" to most Americans than Charles Ives only because of familiarity, not because Ives does not make beautiful music. We can apply my analysis here, too. A participle here is acceptable. The part of this sentence that makes it unfamiliar to your ear most is the "not." I think you would accept: "I know doubting stinginess." However, if you do not, then your other problem is the fact that you have a difficulty accepting "doubting" as a modifier for "stinginess." Well, languages change, so does syntax. But I think that most native speakers would find the line about "eating Death" awkward. The question is, "Why?" The cause might be more semantic than syntactic, but I'll need to think about this. Do you still have access to JSTOR? I do not have an account. But I found an interesting article, which may be relevant here. "But I think that most native speakers would find the line about "eating Death" awkward." I would agree. That's the problem for Charles Ives, I believe. Looks useful. I might have access at my office. We'll see. I will probably have to go into this issue slowly, due to an increased workload, so I might not have answers for a while. I have been thinking about what Haynes says about the line. It is an interesting suggestion. Perhaps he is correct to suggest that we should read the line as both "Greek" and English. Not being an expert of Milton, I don't know if this would be proper, though, and so will not form an opinion on it at this time. Ignorant of Haynes's suggestion, the way I would have read the line would be to have read the "Greek" syntax, also, but by keeping it in the background as suggestive and not literal. The English would come first. But it is easy to see how a native Enlgish speaker would read the line and think of the meaning, "and knew not that she ate Death." But this only proves that I am not an expert on Milton. Jeffery, is Haynes correct to assert a Greek syntax? The Greek is a possible model, according to at least three Milton scholars, for Milton's poetry often does have echoes of Greek and Latin. But the line could have been constructed without that model, and even readers ignorant of these two ancient languages would be able to figure out what is meant in Milton's line. "and even readers ignorant of these two ancient languages would be able to figure out what is meant in Milton's line." Actually, English syntax bars the "Greek" meaning. English poetry can suggest the "Greek" meaning, but English syntax formally must reject that meaning. In this line, English keeps the participle as adjective modifying the noun that follows. What Haynes seems to be saying is that, by applying Greek syntax, the participle may be considered part of the transitive verb phrase: "knew...eating." This, of course, is nonsense in English. This was what I was asking about. Should English speakers be considering or be aware of Greek syntax to properly read a seminal English poem? There is nothing inherently wrong with this. If this was Milton's intent, I'd say it's pretty creative. But it would also be intensely annoying for lay folks, such as myself. ^My Korean is limited. But I believe Korean does not have participles following a verb since verbs must close sentences. But perhaps, Korean has something similar to the "knew eating" type of verb form. I believe Korean has a double verb form. I don't know what it is called. Whatever it is, maybe this is similar to Greek. Haynes says that participles may be joined to verbs of knowledge or perception, so the use must be particular. I'm not sure that I've clearly grasped your question. Are you suggesting that one of the two meanings is barred in English? Both seem possible to me. Both seem possible to me." Indeed, it seems we are not seeing the same thing. It's fine to say "one eats something." And you are correct to say that we can infer meanings 1 and 2 of your analysis from the line. She ate Death and Death ate her. But that's not exactly what Milton published. English does not permit you to say, "one knows eating something," and mean exactly, "one knows that one eats something." What Haynes is saying is that this is what Greek permits. We should be careful not to confuse participle with gerund nouns. If I say, "I know eating," the verbal here is a noun. You can read the verbal in "I know eating something" also as a noun. But that's not what Haynes is saying. He means that the verbal here is a participle and that Greek allows this particular line to carry a meaning that is barred by English. "She knew not that she ate Death." "And knew not herself eating death . . ."
Probably this is what Haynes and the others meant. "She knew not Death that is an eating kind." "For "Death" as the object, something is missing in Milton's line"
No, neither I nor Haynes is saying that anything is wrong with the syntax. Haynes says that this line is fine if we incorporate Greek grammar. Of course, I know nothing of Greek so I can't comment on the veracity of Haynes's suggestion. On the other hand, I think I know just enough English to suggest with some confidence that English is adaptable enough to easily assign a coherent meaning to the line without adding anything. "She knew not Death, which is a thing that eats." "But the unusual syntax is not limited to its Greek model"
I'm sorry. I see I am wrong on this point. I and you and Haynes and any English speaker all think the line is odd. Yet, we all see in it a great conflation of interesting meanings. This suggests to me that the line has worked perfectly well. We not only understand what it means, we think the possible meanings are interesting and we feel compelled to talk about it with each other. Does this not suggest to you that this bit of poetry is a success? Yes, I think that the line succeeds. Richard Strier considers it a bad line of poetry, due to its awkwardness, I presume. I find the line awkward, but for a purpose, i.e., echoing Death's entry into the world, so it succeeds. Considering that Homer and Virgil were his inspiration, it looks awkward because he was writing "Arma virumque cano" in English. Is the English out of place with what other 17th century writers were writing? I think most of what Milton wrote was oddly worded because he was using Greek forms borrowed by the Romans to write in English. It doesn't work. He should have used those inferior rhyming verses more. Look how well it worked in Lycidas, L'Allegro and Il Penseroso. I disagree that Milton's heroic verse doesn't work, but we needn't get into that since matters of taste often cannot be rationally disputed. However, your question about whether the line might have been perceived as awkward in Milton's time is one that I've also been wondering about. For that matter, did Milton consider it awkward? That would be crucial to my argument. But perhaps unprovable. I get a big chuckle about his theory that Southern people were more intelligent because of the sun heating up their brains. Or that rhyming verse was inferior because it came from the Anglo Saxons. I tried really hard to translate one of Horace's poems into English and yet preserve the meter but English just does not want to do what Latin does. I am not entirely serious when I say that Milton's line doesn't work. It doesn't seem all that awkward to me just very formally worded. Could you give sources for those two opinions of Milton? "However, your question about whether the line might have been perceived as awkward in Milton's time is one that I've also been wondering about." This is the type of question you think about if you read enough poetry. Did people actually rhyme "fearful symmetry?" Or is it simply inspired? Perhaps it was rhymed in some dialects, but most would not have, I imagine. And does "apprOVing goD" really rhyme with "unmOVED?" I think there are some things that will always sound odd. "Symmetry" and "knew not eating Death" are two of these. And I think we all know what these are upon hearing it. And we resist them, no matter how wonderfully they may sound or function. After all, centuries of flipping the subject-verb order has not made it sound any less odd. Ultimately, the convention compelled modern writers to rebel against its general acceptance. And modern readers have largely agreed with the rebels. In the case of "knew not eating Death," I think it is up to the poet to justify his exotic ordering of words. I happen to like it. But I don't think we should imagine that anyone in the past would have found it less odd than we do today. After all, if it was common then, then you wouldn't be asking yourself today whether past generations found it ordinary. I think you would know it as easily as you know that flipping subject-verb order was acceptable in the past. The reason I like using present participles in odd ways as Milton does here is because of its exotic potential, not because of its ordinariness. As a scholar, however, I have to ask and answer questions to set things on a solid foundation . . . so I gotta keep looking. "As a scholar, however, I have to ask and answer questions to set things on a solid foundation . . . so I gotta keep looking." From what I can tell, you seem to be someone who has spent a great deal of time reading poetry filled with kenning. Now there's something that is truly awkward sounding. And if you found kenning in anyway acceptable, then you cannot say that the Milton line is awkward. This is, after all, one of the great fundamental laws governing our universe. I ken you not, for I've no dearth of eating death, and am too far fallen. "I ken you not, for I've no dearth of eating death, and am too far fallen." Let me geat back to you on this later...in the meantime, enjoy your trip across the great whale road. Thanks for the kenning. I'm off soon to greet my kin. Ack! Took me a few moments to shake the cobwebs out but on the Dartmouth site, they have a note for Book 9, line 45 about "cold climate or years" "Milton refers to the traditional belief that human talents were maimed by cold damp climates and by age. Hughes makes the interesting point that Milton was apparently concerned that "our climate" (Preface to Book 2 of Reason of Church Government) would hinder his ability to write his great epic, an allusion to Aristotle's claim that northern races lacked intelligence (Politics 1327b)." Satan comes down from the North, the barbarian hordes swoop down on glorious Rome from the North in Paradise Lost. "Rime being no necessary Adjunct or true Ornament of Poem or good Verse, in longer Works especially, but the Invention of a barbarous Age, to set off wretched matter and lame Meeter; grac't indeed since by he use of some famous modern Poets, carried away by Custom, but much to thir own vexation, hinderance and constraint to express many things otherwise, and for the most part worse than else they would have exprest them........"
Who were the barbarians if not the Anglo Saxons? Although I suppose one could suspect they were the Celts. Okay, I now see what you were referring to. I knew that it sounded familiar. Milton apparently suffered in cold, damp weather and worried about being able to finish Paradise Lost (as he mentions in the poem itself). I'm pretty sure that the "barbarous Age" referred neither to the Celts nor to the Anglo-Saxons. I think that Milton probably meant something closer to his own time and more pan-European. I haven't investigated, but that's how I've read the remark. Is the 21st Century an "Asian Century"?